The lead time is 3 to 6 weeks for a small harp if not in stock and 8 to 12 weeks for a professional harp. What shipping methods are available and what are the potential shipping costs? 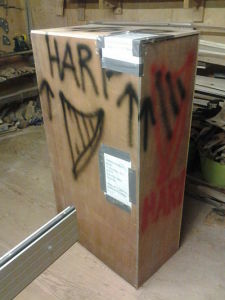 A small harp can be shipped by courier (€60 which includes packaging and insurance). For Irish orders, I would advise customers to visit the workshop, try different models and collect the harp. For international orders, a courier service is also available and all harps will be shipped in a wooden crate. Depending on the harp size, packaging and courier, prices will vary between €300 and €500. What type of strings do you use on your harps? I use nylon strings on the Callan 26. I use “Alliance Savarez” carbon fibre strings on the Callan 32 and Callan 34 and the bass strings are fitted with steel wound strings and steel wound on nylon core. Can your harps be fitted with steel or gut strings? Yes, all Callan harps can be fitted with gut strings. However, the harp frame is not designed to sustain the tension required for steel strings. How long will it take for the strings to settle in and stay in tune? A new harp generally takes up to 6 months to fully settle in. All Callan Harps are guaranteed to be free from defects in materials and workmanship for two years from the original date of purchase. All Callan harps come with a two year limited warranty to the first owner. Any damage due to carelessness or negligence from the user will void the warranty. Normal wear and tear on any part of the instrument. Our warranty does not apply in cases where instruments have been abused or accidentally damaged. Warranty does not apply in the case of harp damage due to malfunction of harp straps or case straps. As a company that has been building harps for over 6 years, we continue to place great importance on providing our customers with support for their instruments. There is a great balance that needs to be achieved between building an instrument for structural strength and building an instrument for great tone. It has been the aim of Callan Harps to build instruments that achieve this balance combined with a simple and light weight design that is affordable, but yet preferred by beginners and professionals. As all woodworks and musical Instrument builders know, wood can be unpredictable, especially when exposed to different environments over time. That is why we are happy to provide assistance if you happen to encounter a problem with your instrument, even years later. Harps will over time need to be serviced, due to playing and tuning regularly, and wood movement etc, buzzing on strings may occur, this is normal, and doesn’t mean your harp is defective in any way, or that you have broken your harp. This may occur days/ weeks or months after you purchase your harp. Callan harps will have the finial decision. As a small family owned business we are proud to stand behind our instruments and products to ensure quality and customer satisfaction. In the rare event that you may be unsatisfied with your harp, please contact us within 10 days of receiving your harp. Returns will not be excepted without prior consent from Callan Harps, and are at the sole discretion of Callan harps. The customer is responsible for shipping charges including insurance both ways. Damage resulting from handling or inadequate packaging on the return will be the responsibility of the customer. Where can I get a replacement string if a string breaks? I can provide extra strings, at an additional cost at the time of purchasing your harp, or I can send replacement broken string by next-day delivery Post at an additional cost. Will my harp need a service and how much does it cost? Yes, generally after 12 months or earlier if the instrument is played a lot. There is no charge for the first service. If I buy a smaller harp, can I trade it in for a bigger model? Yes, provided that the harp is in very good condition. I do offer a trade in giving nearly the full price for your harp against a new bigger model. Can I purchase a spare set of strings and at what cost? Yes I can sell spare strings separately. A full set costs approximately €230. Please get in touch with me through the Contact Form if you require further information about any aspect of the harp making process.